Contractors discovered an air-raid shelter dating from the early 1940s beneath the Bann Bridge in Portadown in 2005. It is a rare find in Northern Ireland. Building contractors discovered an air-raid shelter beneath the Bann Bridge in Portadown in 2005. Thought to date from the early 40s, it’s believed to be one of the last remaining in Northern Ireland. Widening and strengthening the Bann Bridge in the Edenderry area unearthed the discovery. The shelter is an impressive wartime structure. It is one of the only intact examples of this type of air raid shelter in the country. Built into the river bank, it is both rare and well-preserved. 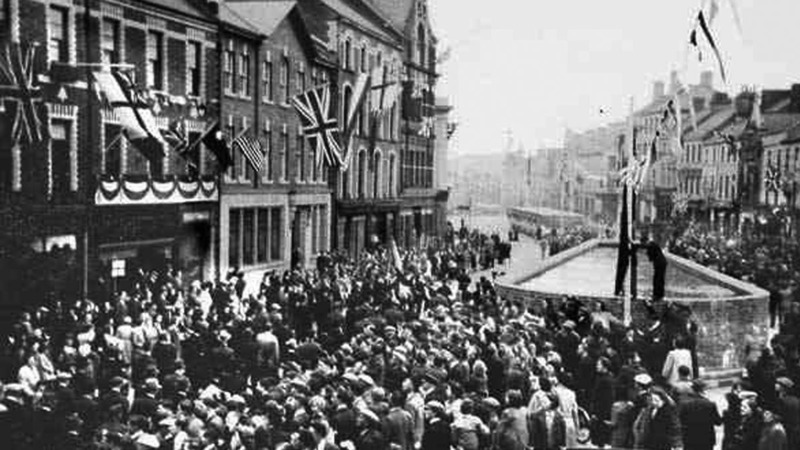 The VE Day celebrations in Portadown, Co. Armagh. Crowds gather outside St. Mark's Church from where you can see a water tank in the foreground and an air raid shelter further down the street. Photo from Portadown Photos. The discovery in Portadown coincided with the 60th anniversary of Victory in Europe Day. Celebrations on VE Day occur on 8th May and 2005 became a significant one in the county Armagh town. I would like to see the shelter kept and protected. It is a very important part of Portadown’s history and it needs to be looked after. Local people, historians, and enthusiasts decided to preserve the site for future generations. After discovery, Farrans continued working around the 20′ x 6′ shelter before recovering it. The air raid shelter once again became hidden beneath the concrete bridge. The council placed a time capsule inside the shelter before covering it over. It contains a collection of items from the town’s recent history. The hope is that a new generation might one day rediscover this historical site. From there, they will be able to learn more about the town and its post-war history. Ten public air raid shelters such as this equipped the town of Portadown in County Armagh. In 1940, the government decided to protect towns from the threat of German bombers. Portadown was well fortified for a town of its size. Public shelters were few across Northern Ireland. The government at first believed German planes would not be able to cover the distance to bomb Ulster. Their fuel tanks were too small to make it from Germany to Northern Ireland and back on a raid. With Nazi occupation of France in 1941, all this changed. The Belfast Blitz in April and May 1941 was proof the German’s could make it. Some older residents of the Portadown area remembered playing in shelters as children. It is not known where the other shelters stood or if any trace of them remains today. The Bann Bridge air raid shelter may be the only one preserved in the town. Though it is inaccessible, the council placed a brass plaque on the outside of the shelter. A plaque marks the site of the Air Raid Shelter under the Bann Bridge in Edenderry, Portadown. Built in the early 1940s, the site was rediscovered by a construction crew in 2005. Photo taken on 8th January 2014. The plaque marks the site of the shelter next to the River Bann and details the date of its finding. Other examples such as the Carrickfergus shelter have not received the same care. It is sad to see World War Two heritage disappear across the country in the name of development. 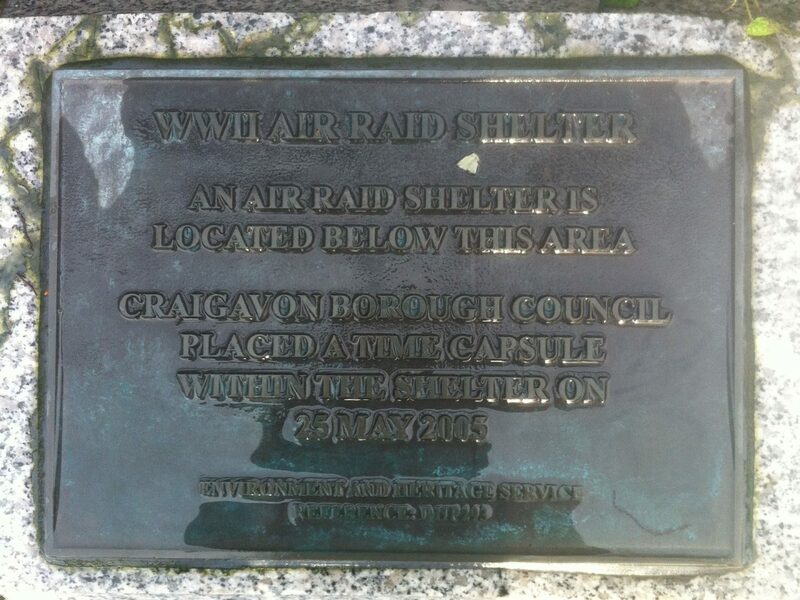 We congratulate the Craigavon Borough Council for their foresight in maintaining this site. If you enjoyed this post on "Bann Bridge Air Raid Shelter, Portadown, Co. Armagh", please share with your friends and followers. Mrs. Maria Todd had been the organist at Tartarghan Parish Church for over 50 years when she died in a road accident during the blackout in October1940. Drumcree Church of Ireland churchyard in Portadown, Co. Armagh contains five Commonwealth War Graves dating from World War Two between 1940 and 1946. Seagoe Cemetery in the Co. Armagh town of Portadown contains fourteen Commonwealth War Graves relating to World War Two dating between 1940 and 1946. The old Plaza Ballroom building on Bridge Street, Portadown has had many uses; in recent times a funeral parlour but in the 1940s, it was full of life. The Bleary Pillbox is similar in construction to nearby structures at Drumlin Hill, Moyallan. It is one of seven pillboxes in the town making up defences along the River Bann. Camp 11a, the Brownstown Prisoner of War Camp, was lost beneath redevelopment of the Brownstown Estate in the 1960s but residents remember German inmates.